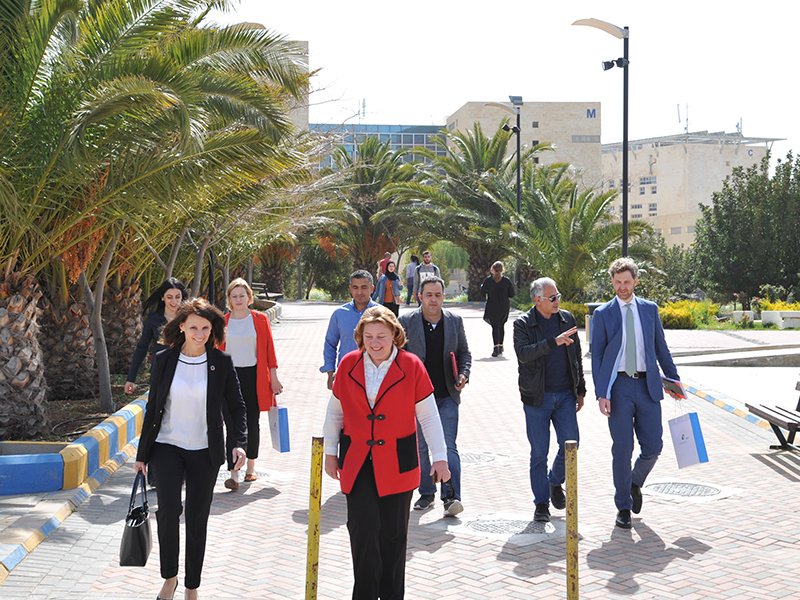 On Monday, April 8, 2019, Mrs. Rita SCHWARZELÜHR-SUTTER, Parliamentary State Secretary at the Federal Ministry for the Environment, Nature Conservation and Nuclear Safety, accompanied by assistant Mrs. Guretskaya and Head of Press& Cultural Department at the German Embassy in Amman Mr. Tobias Caris visited the German Jordanian University, to learn more about the university in particular the Solar Energy Project. The President of GJU Prof. Manar Fayyad welcomed the guests in the presence of Dr. Ayman Bataineh and Dr. Mustafa Jaradat from the School of Natural Resources Engineering and Management (SNREM) at GJU. Prof. Fayyad briefed the delegation about the university, its programs and majors, the main features of GJU, especially the German Year and Projects handled, assuring the firm relations between Jordan and Germany. The delegation was escorted to the central monitoring system for Anwar Project where Dr. Firas Alawneh conducted a presentation about the system and its implementation. It is worthy to mention that Mrs. Rita’s visit comes within her participation in the World Economic Forum MENA in Jordan.